Burials have been taking place in the Pakistani city of Peshawar after a double suicide bombing killed at least 80 people at a church on Sunday. 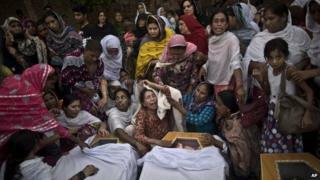 It is thought to be the deadliest ever attack on Pakistan's Christians. Two Islamist militant groups with Taliban links said they ordered the attack to hit back at US drone strikes. Political and religious leaders condemned the attack, but angry crowds took to the streets denouncing the state's failure to protect minorities. On Sunday, demonstrators blocked roads in Peshawar, Islamabad, Lahore and Karachi and rallies are also expected in major cities on Monday. The BBC's Aleem Maqbool in Peshawar reports that as mourners reached the site where the coffins bearing the dead are lined up, some broke down on the spot. Many of those coming to pay their respects were simply overwhelmed by the sight that greeted them when they reached the school playing fields besides St John's Church. Some broke down on the spot, seeing the long line of coffins, the hundreds of women sitting beside them, clutching them and sobbing, the men hugging and crying, their children looking bewildered. Of course there is shock - there has never been as devastating an attack as this to target Pakistan's Christians - but there is certainly anger as well. The attack happened as Pakistan's government prepares the ground for talks with the Pakistani Taliban. Many young Christian mourners made their feelings known on the subject outside Peshawar's Lady Reading hospital; shouting insults and angry chants against Prime Minister Nawaz Sharif and against one of the most well known advocates of talks with the militants, opposition politician Imran Khan. Hundreds of women were sitting beside the coffins, clutching them and sobbing, the men hugging and crying, their children looking bewildered, our correspondent reports. Condemnation of the attack has been pouring in. The government has announced three days of mourning. Christian groups have said special prayers will be held for the victims. Pope Francis has condemned the atrocity, saying those who carried out the attack made a wrong choice, of hatred and war. Speaking in London on his way to New York to attend the UN's General Assembly, Prime Minister Nawaz Sharif said the attack does not bode well for any intended talks with militants. And the Pakistani politician, Imran Khan, whose party governs the Khyber Pakhtunkhwa province, of which Peshawar is the capital, called it an attack on humanity. He has been criticised for being soft on Taliban militants and favouring talks instead of military action. At around midday at the historic All Saints church in Kohati Gate, a bustling area of Peshawar, two bombers blew themselves up as hundreds of worshippers who had attended Sunday Mass were leaving. Witnesses said they heard two blasts, the second more powerful than the first. Suicide vests were later found outside the church, officials said. Reports say the walls of the church was dimpled from the force of the ball bearings that had been packed into the explosives, in an effort to cause as much damage as possible. More than 120 people were wounded in the assault. It is unclear exactly who was behind the attack, with two militant groups claiming responsibility. Jandullah and the Junood ul-Hifsa - both with past links to the Pakistani Taliban - said they ordered the double bombing in retaliation for US drone strikes in Pakistan's tribal north-west. The Pakistani Taliban, however, condemned the attack. Correspondents say the group frequently denies responsibility for attacks which take a heavy civilian toll. It is the latest in a series of attacks on Pakistani Christians, who represent about 1.6% of the country's overwhelmingly Muslim population. One provincial lawmaker, Fredrich Azeem Ghauri, said there were about 200,000 Christians in the province, of whom 70,000 lived in Peshawar, Agence France-Presse news agency reported. Correspondents say the attack has outraged many people, but there is also a sense of helplessness about the government's apparent inability to prevent such atrocities. There were angry scenes outside the church, with friends and relatives denouncing the government, but demonstrations spread rapidly and in Karachi police had to fire tear gas. Militants in Pakistan have long made religious minorities one of their targets and recent years have seen spiralling sectarian violence between Shias and Sunnis, with Sunni militants often targeting the Shia community. There have been outbreaks of communal violence in areas where Muslims and Christians co-exist. In march, Muslims in Lahore torched dozens of Christian homes responding to an allegation of blasphemy. But this latest attack is being described as the first assault of its kind on Christians in recent memory.